Roof rats have a much smaller geographic range than their cousins, the Norway rats. In the United States, Roof rats (Rattus rattus) are found mainly along the southern Atlantic and Gulf coastal States, along the Pacific coast from California north to the Canadian border, and in Hawaii. Norway rats, on the other hand, can be found in all U.S. states and territories. Roof rats are sometimes called "tree rats" in some parts of the United States, and people in many other parts of the world call them "black rats." Roof rats are smaller, more slender, and more agile than Norway rats and may be gray, brown, black, or of mixed colors. They also have more pointy noses and much longer tails than Norway rats. There used to be several subspecies of roof rats recognized by taxonomists; but those distinctions have been abandoned due to extensive cross-breeding between the subspecies, which has rendered the distinctions irrelevant. In nature, roof rats are preferentially tree-dwellers. They'll sometimes occasionally nest on the ground under piles of debris, in stacks of firewood, in abandoned vehicles, and in other protected places; but they feel more comfortable in higher places. They are accomplished aerialists and are quite adept at running along utility lines, tree branches, and tree limbs. Like squirrels, roof rats have adapted to human encroachment into their natural habitat by infesting homes and human-occupied buildings. 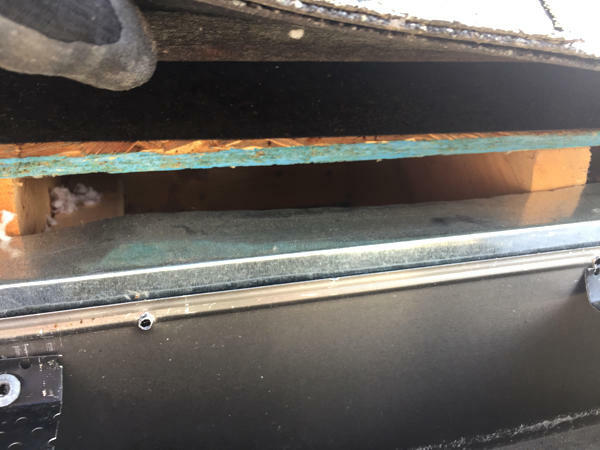 They usually enter buildings through gaps in roof soffits (especially the gaps that most homes have between the roof sheathing and the fascia board), attic and roof vents, gable vent windows, and other openings. Roof rats don't need a very big gap to get into a building. In a pinch, they can get through any gap roughly the size of their heads. If they do need to enlarge a hole, their powerful jaws and teeth are more than up to the task of gnawing through most building materials. Once inside a building, roof rats create a health hazard with the their droppings, bodily excretions, and parasites; and a physical hazard through their gnawing. Many fires are caused by roof rats who gnaw through electrical cables. Roof rats have also been the primary reservoirs of bubonic plague for all of recorded history, and are associated with the transmission of many other diseases. Finally, roof rats are the animals that gave birth to the pest control industry. The first exterminators were called "rat catchers," and as the name implies, they spent the great bulk of their time catching rats and removing them from buildings. Roof rats are difficult to control. Their aerial habits make trapping and exclusion difficult and hazardous, and the fact that they subsist largely on fruits, nuts, and berries that they find in nature makes it difficult to deprive them of food. The only reliable way to rid a building of roof rats is to seal them out -- and that's not easy to do. If your home or business has a roof rat problem, you really need to call a professional exterminator or wildlife management company. But if you want to try it yourself, here are some do-it-yourself suggestions. 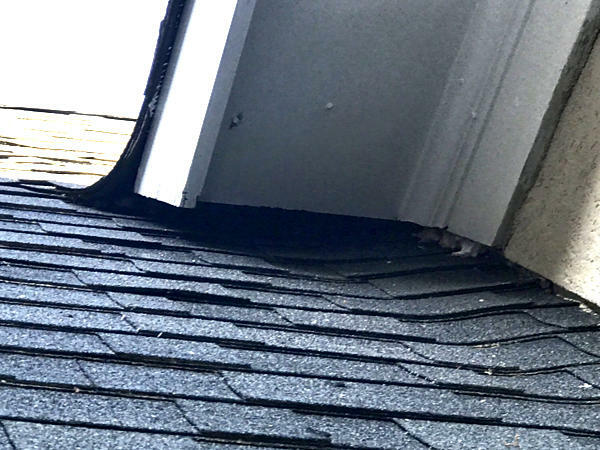 Bearing in mind that roof rats can squeeze through gaps roughly the diameter of a dime, you'll have to seal off any openings that the rats could possibly use to get into your home. In other words, think like a rat and try to find -- and seal -- every possible way into the house. That means finding and sealing gaps and holes such as spaces around pipes or utility cables, openings in soffits, gaps between the roof sheathing and the fascia board (that's an important one), uncapped chimneys or roof vents, or any other possible openings. Gaps can be sealed with a variety of products, but heavy-duty hardware cloth is one of the easiest to use. If you were using it to seal the gap in the picture shown here, you'd wrap the hardware cloth around over the gap and screw it to both the top of the sheathing and to the fascia board using stainless-steel screws. Bear in mind that roof rats have very powerful jaws and can chew through most building materials as long as they have a starting point to wrap their teeth around. So even if a gap is too small for a roof rat to get through, it's perfectly capable of enlarging that gap until it has a hole fit for a rat. So again, think like a rat. You can't just seal the gaps that already are big enough for a rat to get through. You have to seal any gap big enough for a rat to wrap its teeth around. There are some gaps that can't be sealed with hardware cloth, such as openings where electrical wires pass into the house. For these gaps, your best bet is to use copper wool and a sealant designed specifically for rodent exclusion, such as Dow Great Stuff Pro Pestblock. I suggest you buy the complete pest exclusion kit that includes copper wool, an applicator gun, and rubber gloves. It will make life easier and save you money in the long run. Don't waste your time with dollar-store insulating foam. The rats will chew right through it. The copper wool, by the way, is essential. It serves as a matrix to hold the sealant together. The way you do this is to first stuff some copper wool into the gap you want to seal, and then apply the sealant to the copper wool. You can also apply the sealant over hardware cloth if that makes sense in a particular location. What's important is to remember that the sealant needs a matrix in order to be effective. Some of you are probably wondering how the rats already inside the house are going to get out if we seal the house up. There are actually two parts to the answers to that question. The first part of the answer is that we're going to set some traps inside the house (usually in the attic) to catch rats that are already there. You can read more about that on this page. Rat trapping techniques for roof rats and Norway rats are basically the same, so rather than typing that whole page all over again, I'll just point you toward it. Please read it to learn more than you ever wanted to know about rat traps and how to use them. The second part of the answer is that we're going to leave the rats one and only one way out of the house, and then we're going to install a funnel trap on that one opening. Ideally, the one hole we leave is going to be one that they're actively using. We won't seal that hole until we're sure that all the rats are gone from the house. What's a funnel trap, you ask? It's actually not a thing, but a technique illustrated in the adjacent picture. You basically leave one hole open, and then temporarily install a trap over that one hole so when the animal enters the trap, it can't get back into the house. So you're "funneling" the rats into the trap by sealing off every other way out of the house. Once you're absolutely, positively, 100 percent sure that the last rat is out of the house, you remove the trap and seal up that last hole. I suggest you wait for at least three days after you last caught a rat and since you last noticed any sign of rat activity in the attic before sealing up that one remaining hole. The last thing you want to do is seal a rat inside your house. Obviously, you'll need to use a box-type trap for a funnel trap. 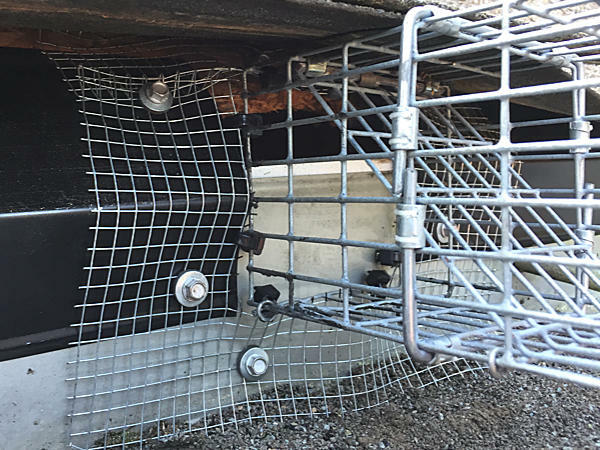 I personally like the Havahart 1082 for roof rat removal work, but pretty much any box-type small live animal trap will work. Once the last rat is out of the house and the last hole is sealed up, you're done. Except that you're not. Remember when I said that rats can chew through almost anything? Well, that includes hardware cloth and other materials used to seal rats out. That means that you have to inspect your home on a regular basis to make sure that all of your exclusion work is still intact. I suggest once in the spring, once in the late summer, and once in mid-autumn. Forever. Other common-sense things you can do to help prevent another roof rat problem include trimming back tree branches so they don't touch or overhang the house, removing or repairing sources of water (like persistent puddles or leaky spigots) from the outside of your home, and practicing good housekeeping with regard to things like garbage disposal. The less attractive your property is to a rat, the more likely they are to move on and become someone else's problem. In previous revisions of this site, I gave some instructions regarding the use of rodenticides for roof rats. I've decided to retract that advice in this revision. As I've become older and wiser, I've also come to believe that there is never a good reason to use rat poisons to control roof rats. Even putting aside all the environmental reasons to avoid using pesticides whenever possible, using rodenticides to treat a roof rat problem is much more likely to cause a rat to die inside a wall or ceiling void than to accomplish anything useful.